The Art Center makes space for transparent interaction with art and the artistic process, inspiring creative exploration and encouraging exchange between audiences and artists. We invite and encourage artists to engage with the city with the hope of expanding their own practices and enriching the context for making in Chicago. Ten years ago, Deone Jackman was a leader in developing a bold vision of a new home for Hyde Park Art Center. The Art Center would be a place where artists of all levels–and from around the world–would gather, create, and forge a community. With the Jackman Goldwasser Residency, another layer of this vision is realized. Deone Jackman’s insight, tenacity, and generosity made it possible for the Art Center to launch this ambitious program. With her support, we are able to bring visiting artists from around the world every year, support a year long residency for a Chicago based artist, and continue to collaborate with other institutions to grow our program and the opportunities we provide. At this time, residencies are curated based on the quality of artists’ work and the impact this residency will have on their practice. International and national residencies range from six to eight weeks, while local artists may be in residence for up to a year, depending on the artist’s needs and project scope. 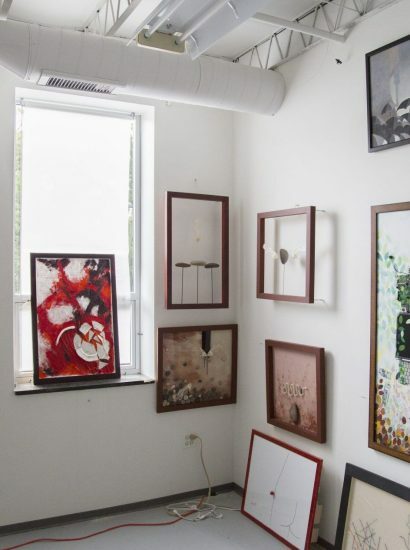 Beyond the studio space, visiting artists are provided housing accommodation, supportive resources, and connection to the city’s artists, institutions, and cultural communities. The Residency Staff facilitates relationships between visiting artists and the wealth of cultural institutions around the city, forges connections to the Art Center’s students, faculty, exhibiting artists and diverse publics. This matchmaking process is central to our program. The facilitation of introductions, studio visits and research expanding opportunities will help grow not only the artist’s network, but hopefully spawn new ideas and processes in their practice. We invite and encourage artists to engage with the city with the hope of expanding their own practices and enriching the context for making in Chicago. Residencies are by invitation only at this time. The ten studios that house our various residencies are located on the 2nd floor of the Center in the The Gudia Family Creative Wing. Our studio spaces are one part of a larger opportunity that comes from being in residence at the Center. Not only are artists given a blank space, with west facing windows to bring in natural light and keep an eye on the ever changing weather but they also have access to staff, classes & the artists lounge at the Center. The largest studio in our block is home to the artist selected for our year long residency that culminates in an exhibition in Gallery 1 at the Center. Often, the artists in residence for this year make large scale installation work that takeover both their studio upstairs and the gallery below. Located in the center of our studio block is the International Visiting Artist Studio, home at the Art Center for their 8-week residencies. Over the course of their stay, it often transforms from a blank space to one covered in research ideas, maps, drawings, & installations. Designed by renowned craftsman Edgar Miller, the Blackstone artist apartment sits tucked in the center for the bustling Hyde Park neighborhood just a quick walk to the Art Center. Miller’s famous stained glass, wood detailing and intricate brick work are visible in this structure which is the home away from home for our visiting artists during their residencies. Find posts by our residents, as well ad features about upcoming residencies or recent work.